Violent protests erupted in Charlotte, North Carolina, on Tuesday night after the police shooting of a black man. 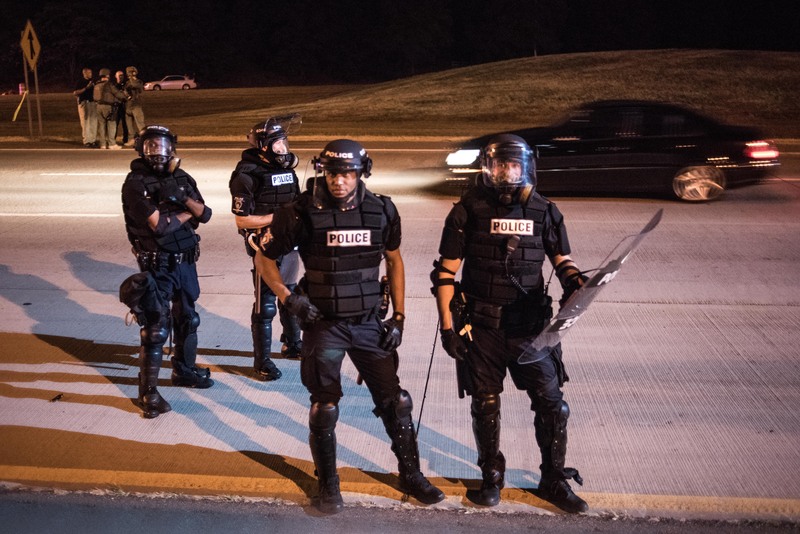 Police encountered Keith Lamont Scott in his car at an apartment complex while serving a warrant for another man and have alleged that Scott emerged from his car with a handgun before he was shot. Scott's family said that he had a book, not a gun, that he was sitting in the car because he was waiting to pick up his son, and that he was disabled. The death of Scott is one of many recent incidents in which police used lethal force during interactions with black men; earlier in the week, police in Tulsa, Oklahoma, released video of the death of Terence Crutcher, another black man shot by police last Friday. Crutcher can be seen on the video holding his hands above his head before being shot. It seems that Crutcher was unarmed; Scott may well have been unarmed, too. But should that even matter? In Oklahoma, where Crutcher was shot, open and concealed carry are legal; open carry is legal in North Carolina, where Scott was shot, as well. Open carry with a permit is also in place in Minnesota, where Philando Castile, a black Minnesotan, was reportedly attempting to comply with the state's gun procedures when he notified an officer of his weapon during a July traffic stop. The officer then shot and killed Castile, whose death also sparked a large number of protests. It would to make sense that in many of these cases — and certainly in the case of Philando Castile — that gun owners' rights organizations would be quick to condemn the apparent infringement on the rights of the gun owner. Yet the NRA did not respond to Castile's death for two days, only to ultimately release a statement calling the situation "troubling" and otherwise refusing to comment. Closely aligning itself with police energizes [the NRA's] overwhelmingly white member base, which provides the group with its political power. Right now, that base is scared that social change demanded by Black Lives Matter will come at the expense of whites' own security and identity. Donald Trump, who has been endorsed by the NRA, released a statement after Castile's death that failed to acknowledge his status as a legal gun owner or the role his race may have played in the shooting. Trump's statement referred to Castile not by his name, but instead as a "motorist," and focused primarily on the tragic shooting of 12 law enforcement officers (five of whom were killed) in Dallas, Texas, a few days after Castile's. Nowhere in the statement was the sort of outrage I'd expect from the man who once told Breitbart that concealed carry permit holders have "an obligation to carry." Referring to the deaths of Scott and Crutcher, as well as the subsequent protests, Trump tweeted "The situations in Tulsa and Charlotte are tragic. We must come together to make America safe again." He followed that tweet with another, "Hopefully the violence & unrest in Charlotte will come to an immediate end. To those injured, get well soon. We need unity & leadership." Based on his otherwise strong support for the NRA and gun owners' rights, Trump's emphasis on "unrest" and the need for "leadership" is striking and disconcerting. If Trump and the NRA are truly sincere in their advocacy for the preservation and expansion of gun owners' rights, I have to wonder why their support appears to wane so much when the victim is black and the shooter wears blue.